Isaac Hayden says Newcastle United will learn from their season-opening defeat – and come back stronger. Rafa Benitez’s side were beaten 1-0 by Fulham at Craven Cottage on Friday night. Newcastle had been looking to get their Championship campaign off to a winning start. But Fulham had the better of an edgy and nervous United side which included five of the club’s summer signings. Midfielder Hayden, signed from Arsenal this summer, was the pick from United’s team along with winger Matt Ritchie, who should have won a first-half penalty and had two second-half shots stopped. 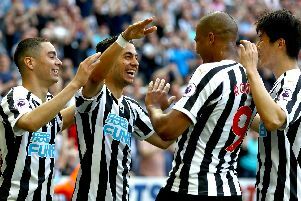 Newcastle must look to quickly put the defeat behind them when they take on Huddersfield Town at St James’s Park on Saturday. “Obviously, it’s a disappointing result,” said Hayden. “We know Fulham were a decent side, and we gave them the respect they were due. “They passed the ball quite well, but, apart from their headed goal, I didn’t really think they created too much, to be honest. “It’s disappointing to concede from a set-piece, but you have to learn from it and we have to go again as a team. “We’re a team, and it’s about learning from this and improving into the next game. “It’s the first game of 46 games – we’re not going to be 100 per cent as a unit (yet), and we’ll keep getting better. “There’s a lot of new signings who’ve arrived in the squad, and obviously we need to get everyone playing the right chord. “It’s the first game, and we wanted to play well, but it hasn’t worked out. “It’s not like we didn’t create chances. I thought we had a decent few chances to score, and it was disappointing that we didn’t take any. “But we gave it our all, as we always do, and it just wasn’t meant to be in this game. “It’s disappointing to concede from a set-piece again, and we just have to take our chances. Hayden spent last season in the Championship with Hull City, who won promotion throught he play-offs. And the experience has taught the 21-year-old just how unpredictable the division can be over the course of a 46-game season. “There are 45 games left,” said Hayden. “Last season there were ups, downs, rollercoasters – every little thing you can think of. “So there’s going to be losses, there’s going to be draws, but at the end of the day it’s about how we react as squad, as a club. Hayden, playing in a defensive role in front of the back four, helped settled Newcastle into the game at Craven Cottage, where United were backed by around 7,000 supporters. But the England Under-20 international feels he can play much better over the coming campaign. “I believe I’ve settled in well, but I always put pressure on myself to do better,” he said. “The more game time I get, the better I’ll become. “Fulham are a decent side and they had a lot of the ball in the middle of the park, their wingers were coming in and their strikers were dropping off. “It was a difficult night with them playing between the lines, but I gave it my all and that’s all I can do to make sure I can help this club in any way I can.